Samsungs 2TB 850 Pro offers the most capacity youll currently find in a 2.5-inch SATA drive, but its upstaged by the bang-for-the-buck of its 850 Evo sibling. (+) Vast: Tons of capacity; good performance; great endurance and warranty; SATA is ubiquitous. (-) Empty: Very expensive; not as fast as PCIe solutions; SATA is limiting. Don’t get us wrong: We love super-fast SSDs like the Intel SSD 750 or Samsung 950 Pro. But while the performance can be impressive, there’s something to be said for carrying around a metric ton (that’s 2,000GB in the Imperial system) of storage. Perhaps equally perplexing is that both the 950 Pro and the 850 Pro appear to use the same V-NAND, which means you can get roughly four times the capacity (2TB) as the 512GB 950 Pro for only twice the price. Yes, the old SATA interface is a bottleneck at times, but for the typical home user it’s frequently not much of a problem, and the ubiquity of the SATA 6Gb/s interface means most systems can handle multiple drives if you’re so inclined. 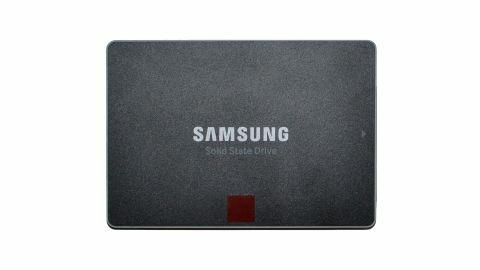 Samsung is currently the leader in the consumer market for SSD capacities, as no one else even makes 2TB-class SATA drives. In the enterprise market, you can find all sorts of crazy capacities, but pricing tends to be prohibitively expensive, and the drives are frankly overkill for the consumer market—unless you happen to be doing 10 full drive writes per day of activity? Make no mistake, however; 2TB of NAND, even with a SATA interface, will set you back a pretty penny. The 850 Pro 2TB we’re looking at today currently costs $873, though it’s worth noting the drive is already $127 below the original $1,000 MSRP. The question we’re here to answer today is how much performance you give up by going for a higher capacity SATA drive compared to a lower capacity PCIe drive. And that’s not the only thing we need to discuss today, as we’re doing a double-header of 2TB drive reviews—see the Samsung 850 Evo 2TB review here. The other offering also comes from Samsung, but it’s their value-friendly 850 Evo 2TB. That drive uses a slightly different controller with TLC V-NAND, but the price is also 70 dollars less—currently $645, though with the holiday sales it’s difficult to tell if that’s representative of pricing we’ll see going forward, or merely a short-term sale. If you’re willing to give up the performance of PCIe SSDs to save some money and go for raw capacity, it makes sense to look at saving even more money, right? Getting back to that SATA bottleneck for a moment, the current standard allows for the transfer of up to 6Gb/s of information. With the 8b/10b encoding, that equates to 4.8Gb/s of actual data, which gives us the maximum throughput of 600MB/s. There’s some overhead involved with any transmission of data, so you won’t actually see 600MB/s, but a good SATA SSD will hit around 550MB/s under load. And there’s the crux of the issue: “under load.” What exactly constitutes a storage load that’s worthy of 600MB/s, let alone moving to the even higher throughput offered by the PCIe interface? One thing that doesn’t qualify as such a load, generally speaking, is the normal daily tasks of most users. Booting your OS is arguably the most intensive task of the day for a lot of people, and even that will rarely push the limits of SATA as there’s plenty of data processing happening in the background (we’ll look at this in more detail in a future article). In fact, for the typical home and office user, the only time you’re really going to push storage performance is if you’re doing a lot of file copying—installing programs is another example of a task that does a lot of file copying. That doesn’t mean there aren’t other viable reasons to have faster storage—there are plenty of other tasks that will benefit, including database accesses, servers in general, and heavy A/V editing—but most of those tasks are outside of the normal purview of PC consumers. Even if the benefit is mostly unused, it’s still nice to have up to four times the performance on the few occasions where you do happen to pound the storage subsystem. But if you’re trying to balance performance and capacity against price, SATA SSDs still have plenty to offer, and you can always use a RAID 0 configuration to improve throughput in a pinch. Given we’re looking at both of Samsung’s 2TB offerings, it makes sense to start with a look at raw specs. These numbers don’t necessarily tell the whole story, but one thing they make abundantly clear is that Samsung doesn’t see a massive difference in performance. Instead, the main difference is in longevity/durability, where the 850 Pro has twice the endurance rating and warranty length. It’s worth noting that 512GB and 1TB 850 Pro models have the same 300TB endurance rating, which means in practice you’re likely to be able to write far more than 300TB of data to the 2TB model—it just won’t be under warranty. The same holds for the 850 Evo, where the 500GB and 1TB also have the same 150TB endurance rating. Other than the minor differences in maximum read/write performance, about the only other advantage the 850 Pro has is slightly lower power use. Both idle at less than 60mW, so mostly we’re talking about active power, when the drives are reading/writing data. TLC NAND ends up requiring a bit more work, leading to slightly higher power use. The 1W difference isn’t likely to affect things like battery life, however, unless you happen to be doing heavy disk traffic—which would generally mean you’re doing other things that will hurt battery life a lot more than storage power use. So, how do the drives actually perform in our SSD testing? Here are the details of our Skylake test bed, followed by performance charts where we’ve highlighted the two 2TB SSDs. Keep in mind that the NVMe drives, while notably faster in some benchmarks, are also far more expensive per GB. There are two key takeaways here. First, Samsung is about the only company so far that really has a handle on doing high-performance TLC controllers and SSDs. The proof is in the near-parity of the 850 Pro 2TB and 850 Evo 2TB; at best, the Pro version is about 15 percent faster than the Evo, and on average the difference is only about five percent. The second takeaway is that it’s really hard to justify buying any SATA drive right now other than the 850 Evo—it is a force to be reckoned with! Which isn’t to say that the 850 Pro 2TB is bad; it’s just hard to justify spending an extra $200 for the small bump in performance. If you need more speed, the Intel SSD 750 is over twice as fast as the Pro, and in some tests more than four times faster! But you do have to give up some capacity, as the largest SSD 750 is “only” 1.2TB. The Samsung 950 Pro also offers impressive performance, but it currently tops out at 512GB, making it a poor fit for anyone eyeing a 2TB SSD. An interesting alternative is doing RAID 0 of 1TB drives; the 250GB 850 Evo is slightly slower than its weightier brothers, but overall it offers a performance benefit over the 850 Pro equal to that of the 850 Pro over a single 850 Evo. That’s the problem the 2TB 850 Pro has to face: It offers plenty of capacity, it’s arguably the best SATA drive around, and the current price of $0.427 per GB is actually pretty compelling; we remember only a year or two back when the largest SSDs often carried a 50 percent price premium. But when you look at the 2TB 850 Evo at $0.323 per GB—which is actually a better price now than buying two 1TB 850 Evo drives for RAID 0—it doesn’t add up. You’re paying extra for endurance that you likely won’t ever need, and gaining only a small bump in performance; besides, if endurance is really that much of a concern, you should probably be looking at enterprise class SSDs. As it stands, both the 850 Pro and 850 Evo are bumping into the SATA interface ceiling. It’s effectively a hard speed limit enforced on these 18-wheelers, and there’s not much difference in the way of improved handling or acceleration to separate them. Unless you absolutely need the capacity and can’t look to PCIe SSDs, and you’re willing to pay more for an extra 5–10 percent performance, these behemoths are close enough to equal that you’re better off saving money and going with the Evo.